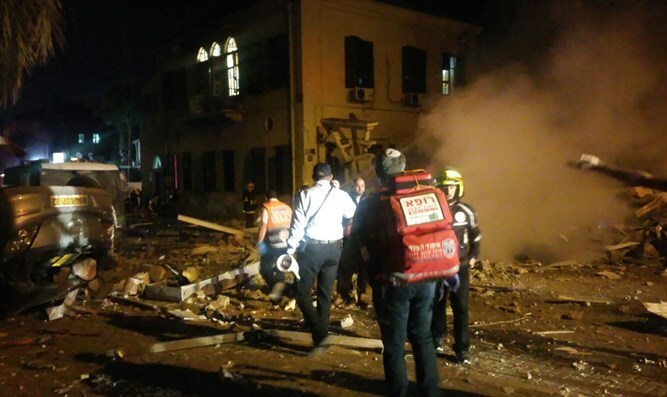 Medic gives first-hand account of events following fatal Jaffa explosion. One of the most difficult things to do as a first responder is to prepare yourself mentally for the situation that you are about to walk into. There are so many variables and so many unknowns that take place in a chaotic scene such as the fire last night in Jaffa that claimed the lives of four people. The Psychotrauma and Crisis Response Unit is tasked with providing psychological and emotional stabilization to the people at the scene of traumatic events who need their help. The goal of the unit is to provide on-scene psychological first aid known as PFA to those suffering from psychological or emotional stress following a trauma. This could be people who were injured, their families, or even witnesses and bystanders. “The woman told me that her husband and children were in the building next door when they heard the explosion and their windows blew out. While she sounded fine, from her physical mannerisms I could tell that something wasn’t right. She needed to be reassured that her needs would be met and it was my job to figure out what those needs were. Sometimes even when a person tells you they are okay, we need to make sure that they are functioning in the now,” Ludman added. After the flames were contained and emergency crews began to look through the wreckage. Some hours after the original explosion occurred, it was discovered that four people were killed in the blast. Many of the responders had already headed home before the bodies were discovered. As the accompanying trauma associated with the deaths can cause a new wave of emotional stress for the family members and friends of the deceased, as well as others who were at the scene, it too, was something that last night’s first responders had to deal with while responding to the scene of the explosion.